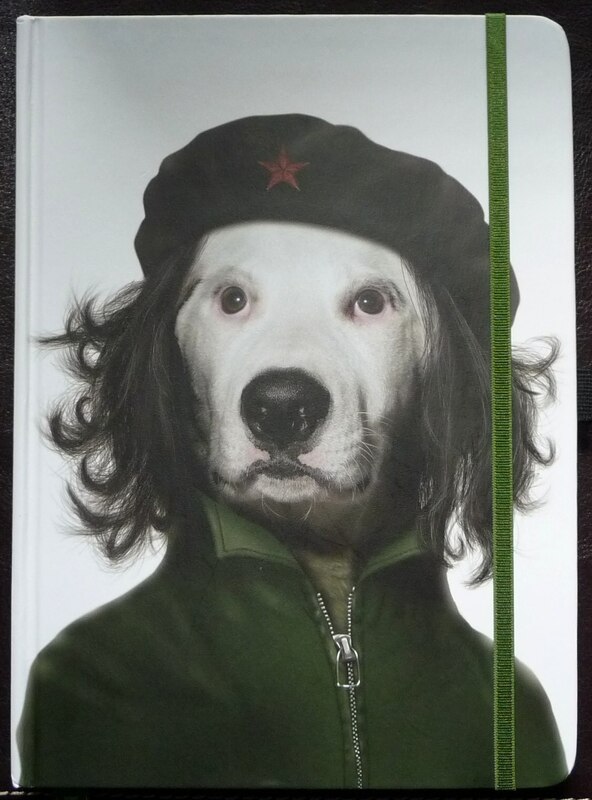 From the moment I saw this journal in the teNeues catalog I knew I had to have it. The cover art was awesome! However, once I received it, I was put off by all the text on the back cover and end papers. I prefer my journals to be relatively clear of that sort of thing. This is an otherwise fairly attractive journal. There is a sturday elastic closure and back pocket. There is also a Bookmark with the teNeues name written down it several times. I’m also not a fan of that. The spine of this journal is more like the spine of a novel. 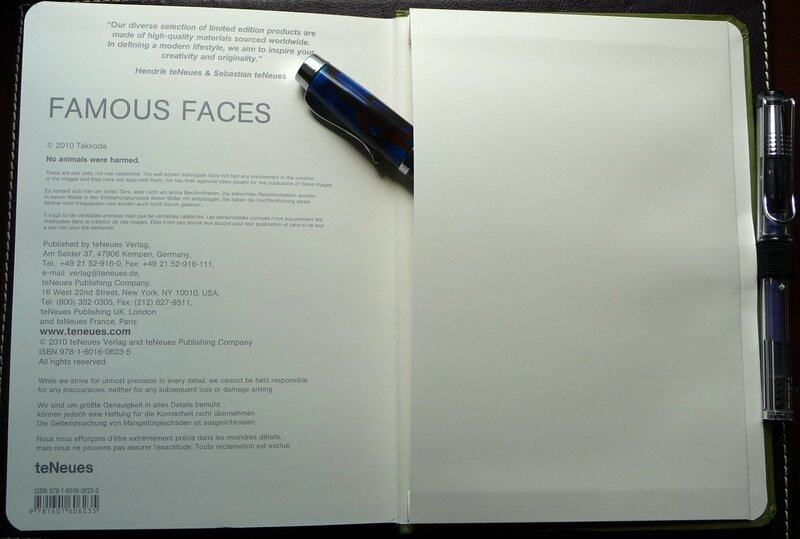 There is a small picture of the cover art followed by “Famous Faces” and “teNeues.” There is a very sturdy pen loop on the edge. As you can see from the photos, it easily accommodates a Lamy Vista. This book is roughly 6 1/4″ by 8 5/8″ and roughly 5/8″ thick. It’s an overall appealing size. This journal’s sturdy binding is not unlike a hardcover book. The cover is that same sort of coated slick film over stiff backer board you would find with a hardcover book. Though it’s all very durable, it’s not what I normally look for in a journal. Still, there is something about it that I quite like. Probably one of my favorite things about this journal is that it lays flat! Gotta love that. 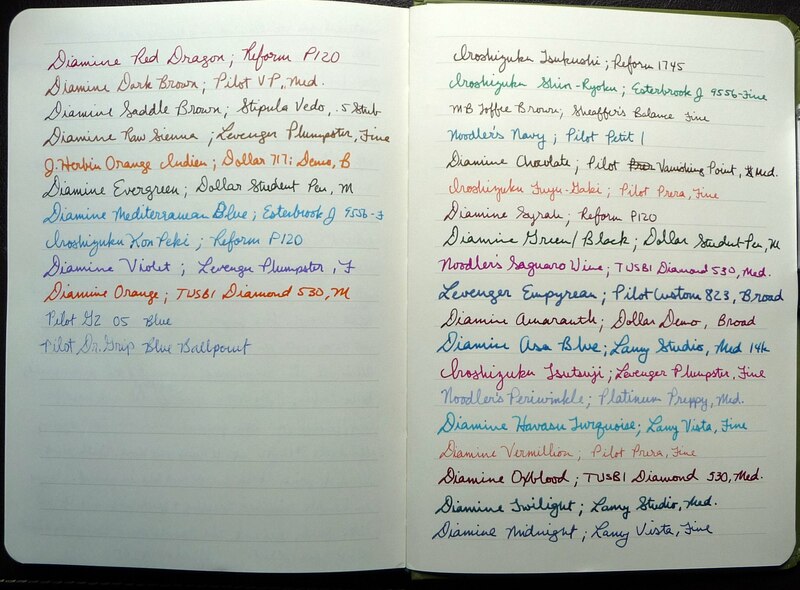 Now for the moment of truth… surprisingly enough this paper is fairly fountain pen friendly. According to the folks at teNeues, the paper is 100g Taiwanese Creamy Woodfree paper. It is not recycled or specially certified like you’d find with Rhodia, Clairefontaine, etc. The pages are off-white with faint gray ruling. As you can see, the ruling is rather wide at 10mm. Unfortunately, this is the only ruling available. It is far too wide in my opinion. I much prefer ruling of about 6mm. You’d be able to get more words on the page that way. 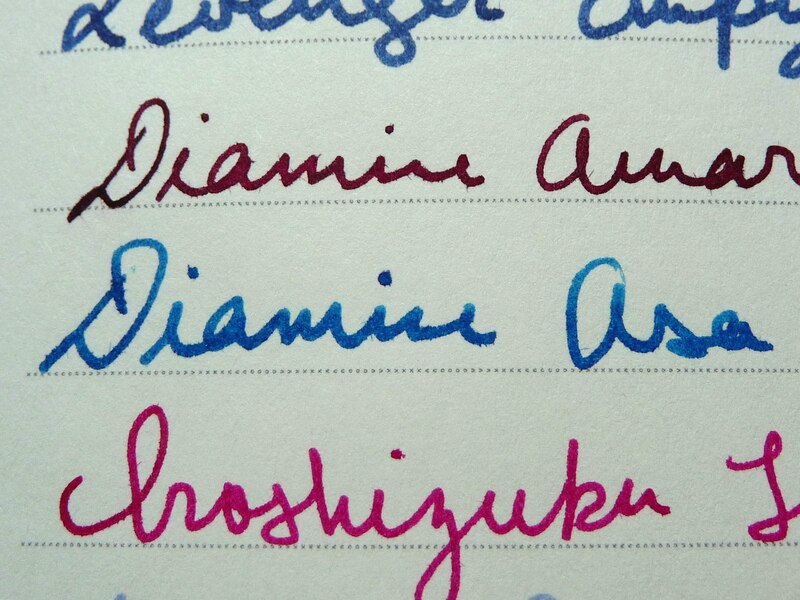 Many of the inks I tried took to the paper well. Feathering was a bit of an issue with the wetter nibs as you can see above, though I did not have any problems with bleed through. You can write on both sides of the page with very minimal show through. The journal will run you an affordable $12.95 at the teNeues website. With that kind of price, it is hard not to be tempted. However, if the folks at teNeues want to break into the fine writing (fountain pen oriented) market they need to make a few changes: Firstly and more importantly, they have to use paper that is consisent in quality and resistant to feathering, bleed through, and show through. Secondly, they need to offer options for page formats from a narrower ruling to a grid or dot ruling to offering blank pages. Third, they need to streamline their journals. Less is more when it come to fine writing stationery. Fountain pen users on the whole, do not want journals that are covered with branding, writing, histories of the company, etc. In general, we’d prefer to have that sort of information available to us on the company website or removable packaging materials of one kind or another. Nevertheless, this is a decent journal at a low price. If you are ok with some minimal feathering and if you like funky cover art the teNeues Famous Faces collection might be up your alley. This journal was sent to me for review by the good folks at teNeues. I am not otherwise affiliated with them.